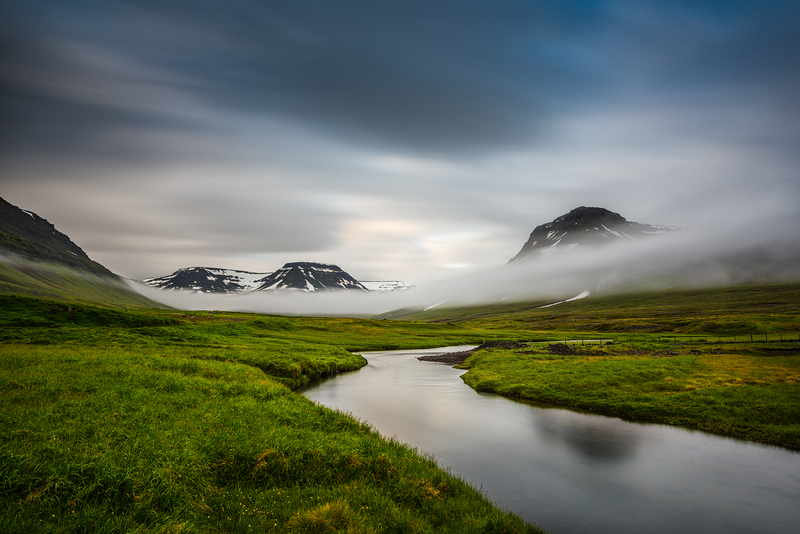 Join this fantastic photography workshop where you'll set out to explore the stunning Snæfellsnes peninsula as well as the wild and remote Westfjords. 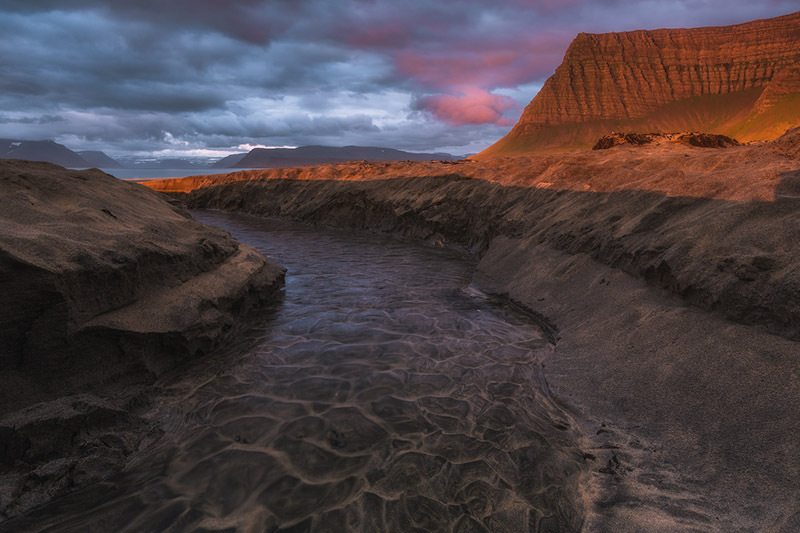 The midnight sun stretches for hours in the Icelandic summer, presenting endless opportunities to capture that perfect picture rendering this tour great for both amateur and experienced photographers alike. Throughout the 11-days, you will be privy to a wealth of natural attractions; cascading waterfalls, dramatic fjords and glittering seascapes, all within your grasp as you take to Iceland’s roads in a comfortable bus and modified jeep. From the beginning, you will be led by your professional photography guide who will help to bring your skills behind the lens to the next level. All accommodations and as well as transportation will be taken care of prior to your arrival, so all you have to do is focus on capturing the beautiful Icelandic nature on film. Don’t miss out on your chance to partake on this epic voyage within the world’s most photogenic country, Iceland. Check availability by choosing a date. Grímsey is an island off the north coast of Iceland, nestled across the Arctic Circle. It is therefore the only part of Iceland that is truly in the Arctic, and many visitors come to have their passport stamped in recognition of its high latitude. It is part of the Akureyri municipality, with a population of approximately 100 people living in the one settlement, called Sandvík. Grímsey’s economy has always been inherently linked to commercial fishing. The island boasts a recently renovated harbour and fertile fishing grounds. Recently, the economy has diversified with the advent of tourism to the island, thus today, visitors will find Grímsey well equipped with modern amenities. This includes guesthouses, cafes and even an airport, which connects to the one at Akureyri. Residents also have the necessary amenities to flourish, with a school and community centre. There is a small, wooden church on Grímsey (albeit, within the parish of Akureyri) that is of significant historical interest. An older church had once been constructed in the 11th century by the Icelandic Catholic bishop, Jón Ögmundsson, which was lost to time. The newer church was built in 1867 from driftwood that had washed ashore. The church was renovated in 1932 and displays a local, century-old imitation of a Leonardo Da Vinci painting. Grímsey also has a famous monument marking the edge of the Arctic Circle: an eight-tonne sphere of stone. The shape was designed to represent the rolling movements of the true Arctic circle, as a rooted monument would not be able to move along with its true location. As a side note, the boulder may soon have to enter the seas to the north, as the Arctic Circle is moving away from Grímsey. It is expected that by the middle of the 20th Century, it will no longer be considered Arctic territory. The island’s biggest attraction is its wealth of birdlife; millions from dozens of species make Grímsey their home. Their numbers are so prevalent here for several reasons. First, the arctic seas around the island have plenty of fish, meaning the birds have plenty to eat. Secondly, hunting the birds and the collection of eggs have also been minimised in the last half century (although the traditions do still continue. Finally, there are no mice, mink or rats, meaning the eggs can lay safely in the low grass. In other parts of Iceland, these invasive species have caused stagnation and even depletion of some bird populations, who before their introduction only had to contend with Arctic Foxes. Most travellers largely come to see the Atlantic Puffins that nest on the island, but there are wide range of other species, including Black-Legged Kittiwakes, Auks, Razorbills, Thick-Billed Murre and Northern Fulmar. The list goes on. The best season for birdwatchers to visit Grímsey is between May and September. Outside of the warmest months, the birds beginning migrating for warmer climates. Other places in Iceland popular for birdwatchers include Látrabjarg, Lake Mývatn and Dyrhólaey. There are a number of ways to visit Grímsey Island. Flights run from Akureyri, and there are ferry services to the island three times a week. Þingeyri is a village in the Westfjords of Iceland, found coastally on the Dýrafjörður fjord. Þingeyri has a population of around 250 people. Þingeyri has been continually inhabited since 1787 when a trading post was established there. The village’s name is believed to be based on the Icelandic term for a medieval assembly - þing. Three grassy mounds, the relics of an ancient, medieval congregation, can be found behind the village church. Like many other smaller settlements in Iceland, however, it is the fishing industry that has dramatically defined Þingeyri’s culture and development throughout the centuries. For locals, the fish stock in Dýrafjörður has been the lifeblood of the economy. They have not been the only ones interested in the bountiful water, however. The French attempted to establish a fishery in the village in the 19th century, but their plea was rejected. From 1884 to 1898, the Americans fished halibut in the region. Today, visitors will find a modern and prosperous village. Þingeyri provides services to both the local region and visitors alike, with: a general store, a mechanic, a swimming pool, a bank, sports facilities and a post office. There are also a number of cafes and restaurants, the most notable of which is Simbahöllin, who specialise in Belgian waffles and run their operation from a renovated 1915 Norwegian home. A short way from the village, guests can also visit one of Iceland’s most picturesque teeing spots, Gláma Golf Club. Built over the abandoned farmstead Medaldalur in 1991, golfers can enjoy 9 holes and some truly fantastic surrounding scenery. Þingeyri sits at the base of the mountain of Sandfell (743m). This stunning mountain can be accessed easily, either by driving or hiking and is known for its easy to navigate footpaths and incredible scenic views. The highest mountain in the Westfjords, Kaldbakur (998m), is also a short drive away and a surprisingly easy climb for amateur mountaineers. Please be ready for your pick up in good time for tour start. This tour is led by award-winning instructor Raymond Hoffmann. Please note that solo travellers must choose a single room supplement. If an odd number of travellers are travelling together and want the odd number individual in a single room, please choose the option as well. You'll land at Keflavík International Airport. 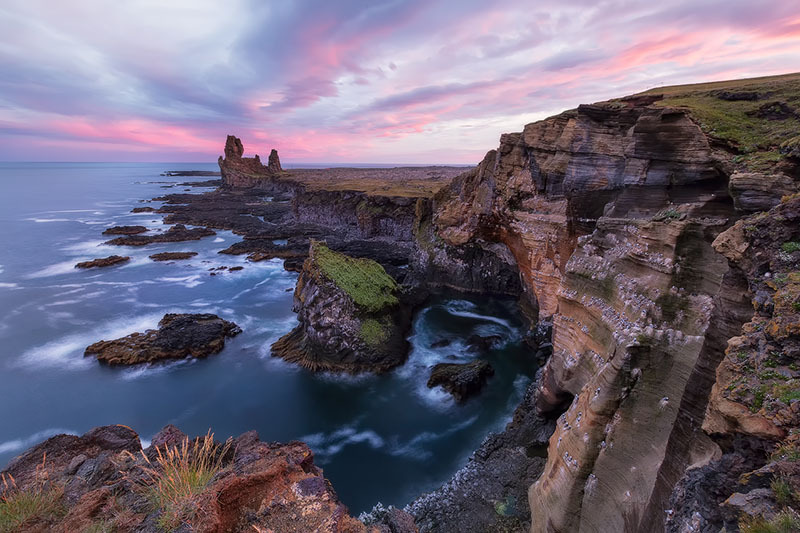 After collecting your bags, hop on a bus and make your way through enchanting lava fields to the capital city of Iceland, Reykjavík. Check-in and drop off your bags at your hotel. If you arrive early, you can explore the city for a while before meeting you fellow photographers and guide in the evening for a meal in the heart of downtown Reykjavík. Over a nice dinner, you'll get to know your fellow travellers and discuss the days that lie ahead. It is time for your photography adventure to begin. Starting with a hotel pick up in the morning, you will be heading west in a specially modified jeep towards the Snaefellsnes Peninsula. The area is often referred to as “Iceland in Miniature” due to its eclectic and exciting collection of natural attractions. You will have the opportunity to capture one of the best sights in Iceland, the extraordinary Kirkjufell mountain which has a unique and fascinating shape making for the perfect photography subject. 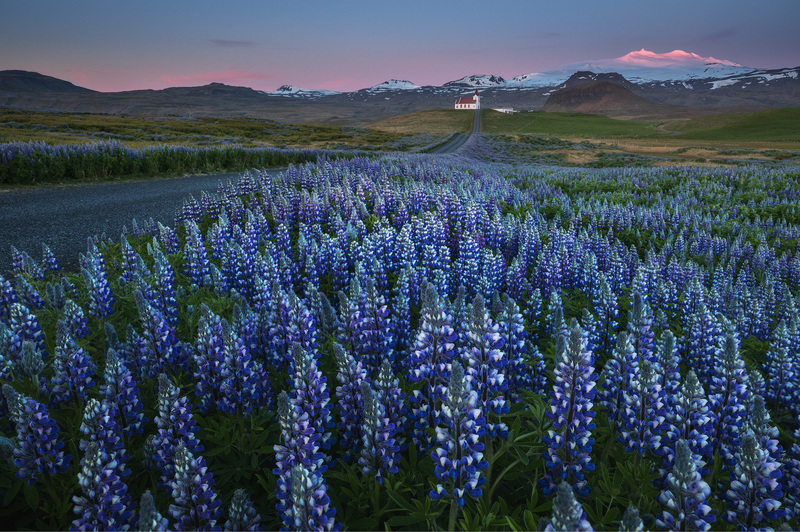 Explore your surroundings through your camera lens and indulge in the dramatic landscapes Iceland is so famous for. 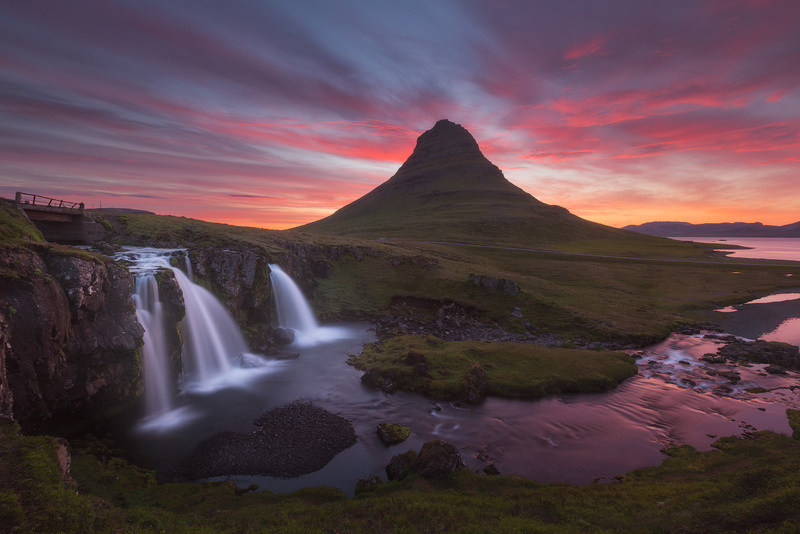 Kirkjufell is just one feature amongst many that you will be able to capture, as the midnight sun allows flexibility and longer hours to explore features such as sea stacks, dramatic cliffs and basalt columns. Another notable stop is the black church at Búðir, a 19th-century building which draws into stark contrast human-made structures alongside striking natural beauty. You'll spend the night at accommodations on the peninsula. Your first subject of the day will be the dramatic and aptly named sea cliffs at Svörtuloft which translates to ‘black ceiling’, where you can photograph the Atlantic Ocean pounding against the cliff face. 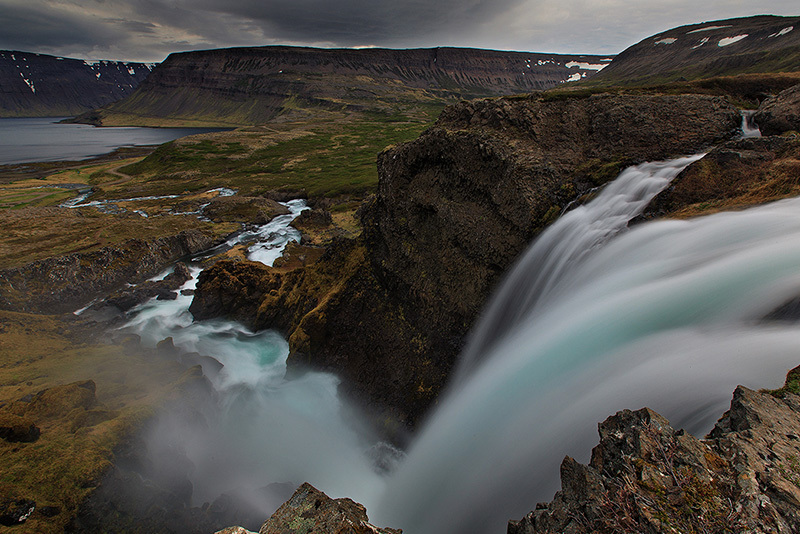 Moving on, you will be transported to one of Iceland's countless waterfalls, Klukkufoss. Under the supervision of your expert guide, you'll be advised in the arts of capturing such natural wonders in preparation for many more to come. Rumoured to be haunted, your next stop is the captivating beach Djúpalónssandur. Littered with pieces of a historical shipwreck, you will inevitably be inspired by the smooth black pebble beach contradicted by the sharp, shadowy nature of the surrounding lava fields. 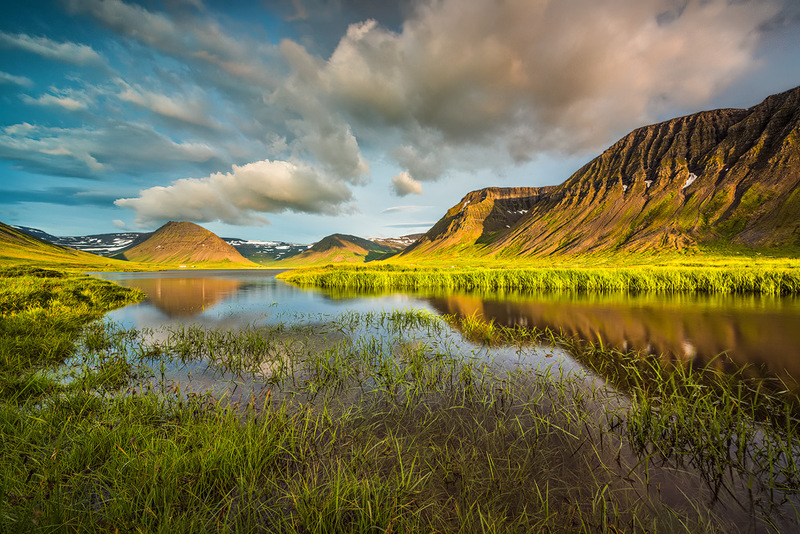 After an exploration of the peninsula, passing through cozy villages and wild landscapes, you will return to the multi-faceted Kirkjufell mountain with a new and perhaps more experienced eye. Contrast and compare your photos from yesterday before retiring to your comfortable accommodation for the night. 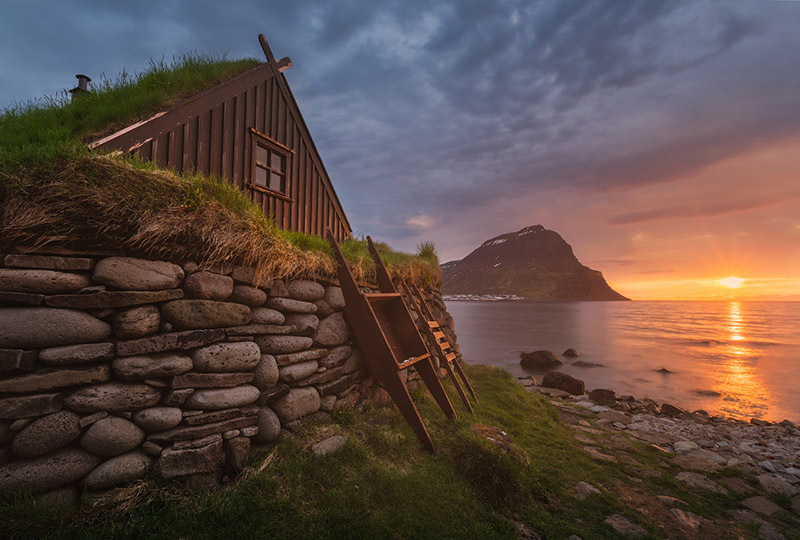 From the charming and quintessential harbour town of Stykkishólmur, you will be ferried across the fjord Breiðafjörður to reach the enigmatic and remote Westfjords. The boat, Baldur, will make a quick stop on the island of Flatey during this voyage revealing an otherworldy far-flung community where birds outnumber people. Keep an eye open for puffins! Upon reaching the Westfjords, your first destination will be the Garðar BA 64 shipwreck, a vessel originally built in Norway in 1912, making it the oldest steel ship in Iceland. This antique makes for a fantastic subject, the first of many in the Westfjords. Next, you’ll be driven up the craggy mountainous route to Látrabjarg, the most western point of Europe. This infamous cliffside is a renowned puffin gazing hotspot, just be careful on the cliff's edge as the burrowing habits of the puffins render the ground unstable. After honing your wildlife photography skills, you will then descend to admire the infinite beauty that is Rauðissandur beach (the Red Sand). The mind boggles how you are still in Iceland as you admire a vast expanse of golden sands shimmering in the glow of the low set midnight sun. You will spend the evening in the idyllic town Breiðavík. Anrnarfjörður fjord is the second largest of the Westfjords and makes a legitimate claim for being one of the most beautiful in the region. The epic inlets and towering mountainscapes cannot help but spark a wonder unparalleled by anything you may have encountered before. Rich in historical and cultural landmarks, your passage through this dramatic landscape will not cease to inspire you and your camera. There will be some historical and cultural stops along the way, visiting the home of famous Icelanders as well as a small idyllic farm. In Icelandic folklore, Arnarfjörður is said to be home of many monsters and sorcerers from the sea. The highlight of the day is the magnificent, cascading spectacle that is Dynjandi. This waterfall thunders down many shelves collectively measuring 100-metres and it promises to leave you truly dumbstruck. Not to worry, your guide will oversee your progress and technique to make sure you are able to immortalise this majestic force of nature whose name literally means 'thunderous'. You will stay in the town of Þingeyri for the night. It is time to ascend the highest peak in the Westfjords, the incredible Kaldbakur mountain. On this route, your photography skills will be focused around abandoned farmhouses; their weathered and time-beaten rustic character pair romantically with their wild and rugged surroundings. Another valley that you will want to immortalise on camera is the Keldudalur valley which is characterised by glacial ponds and towering mountains. This rocky terrain is reflected in the rough road conditions but you won’t have to worry as your driver will expertly navigate you through the winding landscape. You will return to Þingeyri for the evening. Ísafjörður is the capital of the Westfjords and boasts the largest population in the region of 2600 people. You will spend the day exploring the town and photographing interesting locations found nearby. You will then move to Bolungarvík, the second largest town in the Westfjords, where you will have the opportunity to climb as well as photograph the impressive 638-metre high mountain, Bolafjall. The evening will be spent in the beautiful valleys Korpudalur and Ingjaldssandur to capture the beautiful warm sunrays. You will then head back to Ísafjörður where you will spend the night. Travelling around, you will come to a place highly populated with birdlife and seals, presenting the perfect chance for you to practise your wildlife photography skills. There is very little human activity in these parts which make for an immersive experience in the quiet nature of untouched beauty. A favourite subject of photographers in the Westfjords is the Arnarnesviti lighthouse which is marvellously symmetrical and striking in its bold yellow and red against the dramatic backdrop of the wilderness surrounding it. 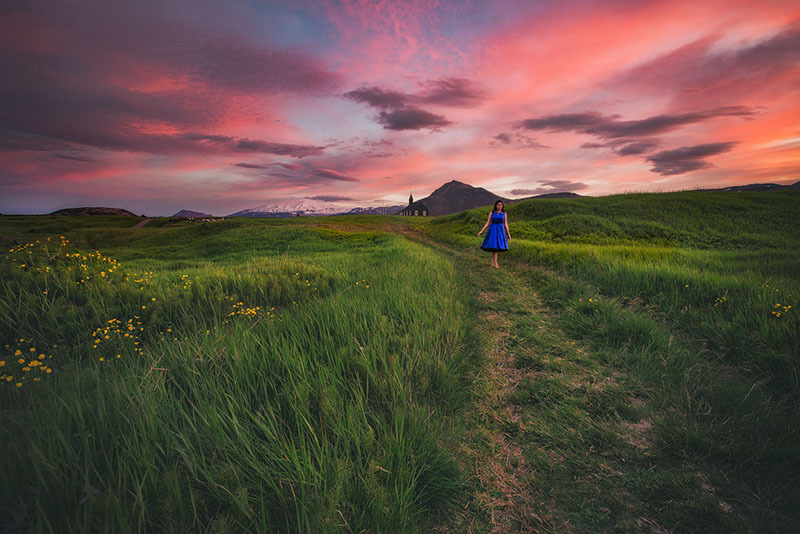 The evening will be spent in Hólmavík where it is highly recommended you go visit the Museum of Icelandic Sorcery and Witchcraft which hosts a fascinating exhibit on the occult. Today you will be off to sea again! Board a boat and head to the beautiful island of Grímsey, home to a huge puffin population in case you had begun to miss the ‘Clowns of the Sea’. Once back on the mainland, you will have the opportunity to photograph the rocky monolith Hvítserkur which resembles an elephant especially in the warm amber glow of summer. Not only is Hvítserkur bathed in the midnight sun but it is also steeped in folklore. You will spend the evening at accommodations in the area. 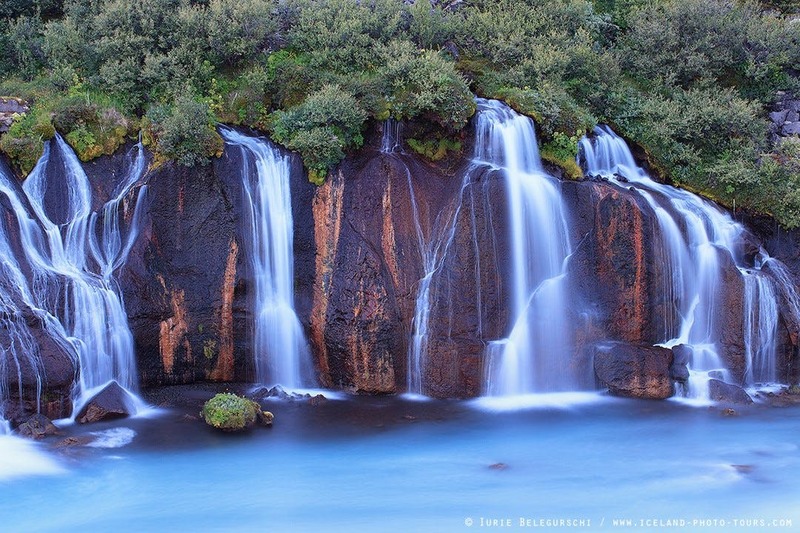 Waterfalls will be your main subjects for today and firstly you’ll be taken to the Koluglúfur canyon featuring the Kolufossar waterfalls where you can exercise your now well-honed nature photography skills. Next, you will stop at the magnificent Hraunfossar waterfalls which are made up of many different rivulets running out of the water basin of the surrounding lava fields. These gently flowing falls are contrasted by the powerful churning waters of the adjacent waterfall Barnafoss. As you make your way back to Reykjavík you can roll over your collective experiences from the last 10-days and maybe review some of your pictures. Dinner will be with the group once more at a restaurant in Reykjavík where you can say your goodbyes to your fellow photographers and guide. Time to leave already! You will make your way back to Keflavík International Airport to continue your adventures or go back home with a stack of memories and a full memory card. Consider coming back in the winter for an entirely new, yet still mesmerising, adventure on this fascinating island. A skilled landscape photographer, Raymond has won many awards for his photography around the world. His photos have been featured in many different mediums and he is an experienced photo guide across many Nordic countries.